Tasty low-calorie snacks are perfect for enjoying a variety of good foods without overeating. Here are some snack ideas that caught my eye (and tongue!). 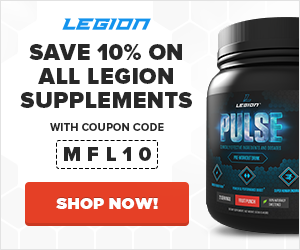 While meal frequency doesn’t help or hinder our goals of weight loss or muscle growth, I like eating a meal every few hours, and eating a variety of foods throughout the day. Protein shakes and bars are a go-to for most active individuals, and so I won’t waste your time by listing those. Instead, let’s have some fun. Here are 5 healthy low-calorie snacks that are quick and easy to make, and quite tasty. We’re all likely to be swayed by cravings for a cheesy pizza, but when you’re closely watching what you eat, one seemingly innocent slice can contain enough carbs and grease to keep you from meeting your nutritional goals. 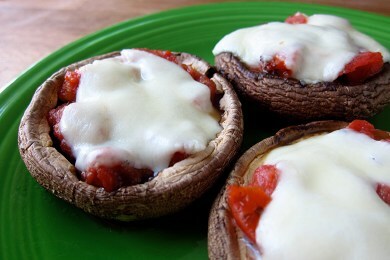 Trick your tongue with these little pizza bites, which replace the calorie-dense crust with Portobello mushroom caps. Use homemade sauce with vegetables and Italian sausage for an even better mini pizza alternative. To make a high-protein snack tailored to your individual tastes, bake up your favorite treats with a few simple substitutions, swapping out oil or butter for non-fat Greek yogurt and trading half the flour for whey protein powder. 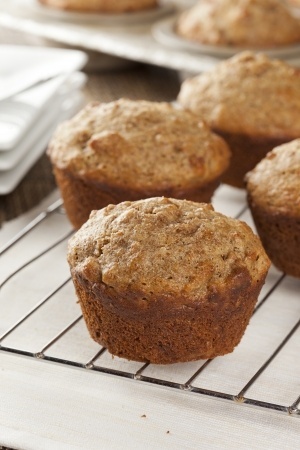 For even more protein, choose recipes that contain eggs and nuts, like these bran muffins. With 1/2 cup of Greek yogurt in the batter, plus 3/4 cup protein powder, each muffin contains 8 grams of protein. And if you take the extra step to bake the bananas, your baked goods will have an indulgent caramelized flavor. Sandwiches make great meals, but half-sandwiches can make a delicious well-balanced snack. This kid-friendly PB&J gets an extra dose of nutrition from chia seeds with this delicious DIY jam. 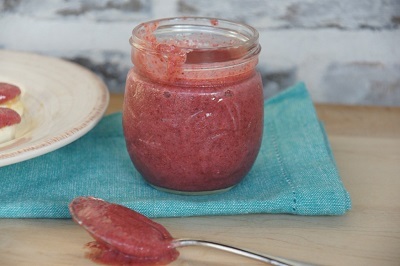 And you don’t have to fuss with the stove because this fruit spread thickens in the fridge overnight. Pick a sprouted grain bread for maximum protein, use one tablespoon of peanut butter, and this quick one-slice sandwich will fill you up with about 10 grams of protein. If you want to make an even lower-calorie version of this sandwich, use PB2 instead of peanut butter. Make this one in your downtime to have on hand for quick snacks and side dishes throughout the week. 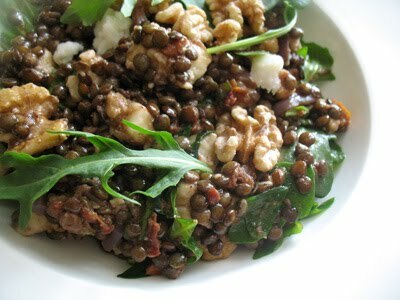 Lentils are already a high-protein legume, but here they get a little help from the flavorful additions of walnuts and goat cheese. The recipe makes six servings, but if you split it into two equal servings you get about 200 calories per. With a good balance of fat, carbs, and protein, it will fill you up until dinnertime. It’s common knowledge that a handful of peanuts or almonds is an easy way to get an extra dose of protein, but 2 tbsp. 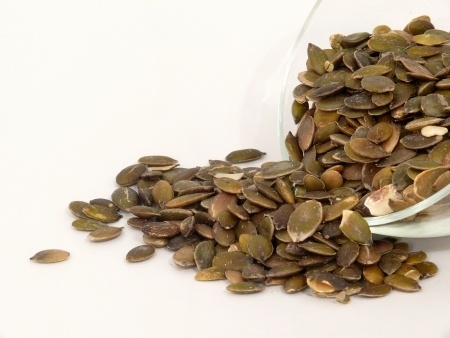 of pumpkin seeds has just as much protein to offer along with a few other beneficial nutrients: zinc, magnesium, phosphorus, iron, vitamin B, vitamin E, vitamin K, and antioxidants. They are also known to have antimicrobial properties thanks to the lignans the seeds contain, which are especially good at fighting viruses. If that’s not enough, pumpkin seeds support prostate health, making this one high-protein snack all guys should add into their diet. What do you think of these healthy, low-calorie snack ideas? Have anything else you’d like to share? Let me know in the comments below!